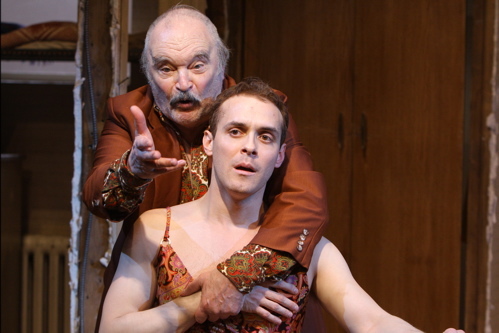 Ted van Griethuysen and Aubrey Deeker in The Walworth Farce by Enda Walsh. Directed by Matt Torney. Photo credit: Carol Pratt. In a dingy public housing apartment three men act out a daily routine, a twisted attempt at farce that’s rife with repeated humiliation and competition. It’s a “routine to keep the family safe,” the patriarch justifies, and it takes a bit for the audience to catch on that what they are seeing is the desperate attempt of an immigrant family to hold on to their past – as the fleeting smell of their mother’s roast chicken fades from their jackets. Irish playwright Enda Walsh is one of my favorites (seeing Disco Pigs is still among my top theatrical experiences in DC), and the brilliant opening of New Ireland: The Enda Walsh Festival at Studio Theatre – Penelope - definitely raised my hopes for the next two productions. The Walworth Farce is next up, and though its first act has the tension build of a horror movie, it slowly winds down when it should crank up in the second act. Perhaps that was only the energy level of the matinee I saw, and there’s still time to get it sharper with the run already extended. The play is perhaps a metaphor for the Irish immigrant condition, with the family patriarch Dinny (Ted van Griethuysen) keeping his boys locked up from the outside world of South London. Keeping them safe means keeping their memories of the home they left behind intact, down to the very smell, their Cork accents untouched. The play’s language is full of the deep nostalgia for things you can barely recall. But the memories the father instills in his sons are false, a story told repeatedly to hide the truth – that their diaspora was a necessity out of guilt and fear. Just to kick up that metaphor even more, the guilt is fratricide, which the boys are doomed to repeat. It’s truly freaky how the first act unfolds, like an Irish Monty Python doing a sick reading of Flowers in the Attic. The three men toss about wigs and prank glasses and 1970′s clothes all too seriously. Then the father notices a mistake, breaks character, and the horror movie begins in earnest. But of course she does. And strangely, when things fall apart for the characters in the play, the production itself starts to falter. Van Griethuysen is perfect in the first act, playing Dinny as a wittily vulgar man who may have had aspirations to be a serious actor once. But that nonchalant noblesse oblige fails in the second act, as he’s required to sharply veer from brutal ugliness to paternal concern. I simply didn’t believe him as a killer, a man so psychotic he would trap his boys in an endless game. The pace also suffers as the play-within-a-play breaks up in the second act, making it sputter on to its inevitable conclusion. That conclusion contains an absolutely shocking final image. The Walworth Farce is at its strongest when it shows how terrifying it is when one imbues the ordinary with monstrous power. When the wrong bread is a matter of life-or-death, in a world where skyscrapers choke and cell phones roast. The Walworth Farce plays through May 1. The Studio Theatre is located at 1501 14th Street NW, Washington, DC 20005. Closest Metro stop: McPherson Square (Orange/Blue lines), Dupont Circle (Red line). For more information call 202-332-3300.